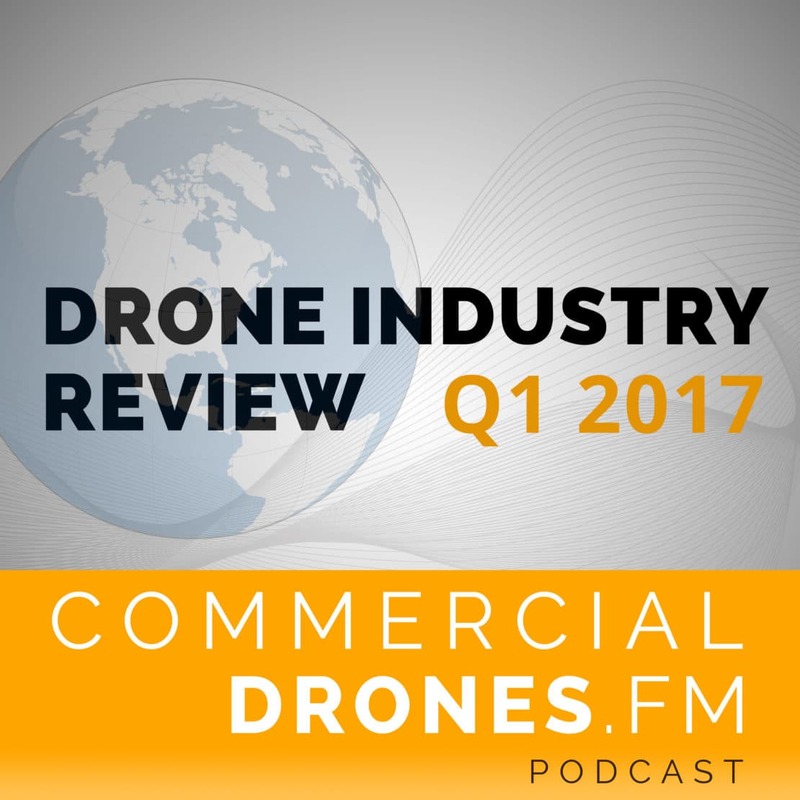 Drone Industry Review is a special podcast series brought to you by Commercial Drones FM. It briefs listeners on the most important and newsworthy happenings from the previous quarter in the drone industry. Covered topics include drone hardware, software, regulations, funding, M&A, delivery drones, and how drones affected various industries in that quarter. The inaugural episode begins with the Drone Industry Review of Q1 2017. Ready for Q2’s Drone Industry Review? Click here to tune in. The high-end quadcopter OEM announced a partnership with drone software provider, DroneDeploy, and their Sky Ranger multirotor platform did complete the first approved, Canadian BVLOS flight. Still expensive, still not incredibly user friendly or versatile for most applications it is making headway. They’re not yet proven but much hyped. Autel Robotics is also working on a VTOL platform called the Kestrel, with a MTOW of 31 lbs. And an endurance of 2 hours, will this drone signal the second coming of the ailing company? Are both crushing the sensor game, the majority of sensors are from these two OEMs right now. 30x zoom sensors from Sony are in Aeryon Labs Sky Ranger drones as well as the new Z30 sensor from DJI are being used on Matrice 200 and Inspire 2 drones. FLIR is spreading, courtesy of DJI. Making thermal imaging accessible to the masses. Photogrammetry still not mastered across the board with radiometric TIFF imagery because of non-standard file types and complexities stitching not just visual data but temperature data. Coupling that with typical fish-eye lenses found on thermal sensors and firmware issues, it’s been tough for thermal to get traction. Likely also affected by high pricing. Sentera is another multispectral sensor producer and announced real-time NDVI streaming, turning your video FPV feed into an NDVI image, but who knows how useful that is. Devin with Flightline Geographics joined me on a very early episode of CDFM #4! And talked about how his Hawkeye UAV system can nearly fly for unlimited distances in perfect conditions as the solar panels on the fixed-wing drone generate more power than it consumes. Nothing has caught on yet. Gives mythical mega endurance of hours upon hours. Software is a bit more challenging to talk about so naturally, it will be quicker to run through. DroneDeploy is doing a great job, leading the way with their drone data App Market where the aforementioned companies, and many others, release software augmentations for DroneDeploy users to automatically count trees, cars, plants, generate automated roof reports, and much more. One challenge with software is that there needs to be more historical data of drone use to make it more useful for applications like machine learning. And we used to say “big data” before it was actually, truly BIG DATA. We’re getting closer but still not there. Reports are a big deal—standalone maps don’t say much. Software that generates something you can share with a colleague or client that tells you what steps to take after flying the drone are starting to materialize. Lastly, one fairly new player of note to the drone software arena is an Austin-based company called Hangar, co-founded by ex-DJI ex-3DR, Colin Guinn. Here we’ll focus mainly on the U.S. market and the FAA. A question: Flights over people—when are they going to be allowed without a waiver? The answer: not yet. Night operations are still a challenge. Drones >55 lbs—this will be big (no pun intended), and currently not many people are thinking about it, but likely because they will require special exemptions to operate commercially. The FAA released their “Aerospace Forecast for 2017-2037” report. The FAA estimated that, over the next five years, there will be more than 3.5 million hobbyist drones and 420,000 commercial drones in the United States. There are currently more than 770,000 drones registered to fly in the US, gaining 100,000+ users in just 3 months from January to March. Insane growth. GoPro re-released the Karma after the huge goof up where the drone was launched and then recalled just days later. You can hear the entire backstory on the Karma drones crashing back to earth in episode #40 of the podcast. Lily Robotics fell spectacularly out of the sky in a ball of somewhat well-deserved flames—they were sued by the city of San Francisco and investigations are underway. Apparently they are trying to get people their money back. Autel Robotics fired most of their sales and marketing team in the U.S.
Airbus may soon join drone industry leaders with their own, home-grown drone service offering based out in Atlanta, Georgia with ex-Airware employee Jesse Kallman at the helm. This section discusses the, “Drones in a box” concepts that fly autonomously every day, return to their box to charge, and then do it all again the next day. Airobotics, an Israeli company which specializes in “drones in a box”, received certification for commercial operations from the Israeli government—they currently operate strictly in Australia and Israel. Drones in a box are expensive and regulations hamper them in U.S. and make the attraction of the fully autonomous value proposition out of reach since you need a human pilot available to take control at any time and cannot operate drones BVLOS yet. Fully autonomous drone economics are not quite there yet but I suspect will soon be. Construction stands to benefit largely from these technologies. Companies like DAQRI, Epson, and RealWear are making useful hardware wearables that enable AR and VR technology to be used with drone data. Imagine wearing a pair of these AR glasses, being on a job site, and getting your drone data of the day beamed to those smart glasses and having the latest volumetric data overlaid in digital AR on top of the stockpile you happen to glance at, or submit a construction RFI by voice, have it geotagged, synced to site plans, and get that as an annotation that’s synced into your drone data platform of choice. That’s a huge construction drone value chain. Or even beyond drones, having every construction worker equipped with smart glasses that take a picture every 30 seconds which gets beamed directly into a cloud-based photogrammetric software suite for processing, with the result being a fully reconstructed 3D construction site model being generated, from the inside out, every single day. These wearables can even help give you increased situational awareness while operating your drone, overlaying a visual of airspace or nearby air traffic in front of your eyes. I’m incredibly bullish on this technology playing a big role in the coming years as drones permeate job sites. They’re still hampered by regulations in the U.S..
Hey, it’s still a drone right? Ok, that’s a bad headline. COW is telecom conglomerate speak for “Cell-on-wheels” and the purposes is to give internet connectivity during times of disaster or during large events. Cool. Eventually, entertainment drones are going to be a large subset of the drone industry and are something anyone can enjoy. It won’t just be light shows but actual, moving props, suspended in air. Coming to a super trendy L.A. mansion party near you in 2018. Watch this space. Not a lot to say here. Drones are increasingly useful at mines and quarries. Aggregate tracking and calculation of volumes, blasting operation planning and analysis, and general overview of the site in general. This means Kespry, one of Airware’s main competitors is definitely on high-alert. They’re going through a technological renaissance. There are so many construction startups popping up. Construction stands to benefit from drones more than nearly any other industry right now. Embracing drone technology is the younger generation coming into the construction game, many of which work in the VDC and BIM departments of construction companies. Asset tracking and integration of data for superintendents for site progress analytics is a huge benefit and useful at every stage in construction. One of my favorite startups that will be working more and more with drone data is called Project Atlas. This is always a tough one. What this industry really needs is more algorithmic analysis and sensor capability + buckets of historical data so they can start developing trends and predictions for their crops. Computer vision and machine learning played a large part in drawing out more useful data for farmers, like automatically counting plants and trees by companies like AgriSens or calculating and quantifying the monetary impact of damage to crops by companies like Skymatics. This past quarter, businesses like DroneDeploy were increasingly integrating with existing ag software suites like John Deere, agX by SST, and others to make it as easy as possible for farmers and growers to get their data from drone to combine. RTK (real time kinematics) gives large efficiency gains in some cases but drones from popular OEMs like DJI have RTK modules which don’t yet geotag pictures for some reason, something that’s required to truly made use of the benefits of RTK for surveying. Using drones for cell tower inspection has huge value but it’s tough job for photogrammetry and is still much better suited for still imagery and high res, big zoom video like the popular 30x optical zoom cameras from Sony. To learn more about this industry, check out past episode with AT&T’s Art Pregler #36 where we dove deep into all the ways that telecom companies can use drones for inspection and work. A note on hardware that will make these jobs easier is the Matrice 200 series which DJI announced. The company even released a hell of a promo video which showcases the M200 as being ideal for the utilities industry. And that’s it. In less than 20 minutes, Q1 2017 of the drone industry is in the books. I hope you enjoyed this Drone Industry Review. We’ll release the next one in July, 2017. If you want to support the podcast, head to patreon.com/dronespodcast and see how just $1/month can keep this show going and get you access to the exclusive Commercial Drones FM supporters-only slack group. Hope to see you there!